The Battle of Ridgeway, June 2, 1866 (courtesy Library of Congress). The Fenian Brotherhood, organized in the United States in the late 1850s, was the American wing of a transatlantic Irish nationalist movement bent on the violent overthrow of British rule in Ireland. Led by John O’Mahony, the Civil War years saw the group grow in numbers, both in terms of members, equipment, and financial strength. While not exactly endorsing their aims, the U.S. government came to a tacit understanding with Fenian leadership whereby the latter would help recruit Irish Americans for the Union army while the former turned a blind eye to the spread of Fenian propaganda and influence within the federal military. By the end of the war, tens of thousands of men belonged to the Fenians despite the strong opposition of the Roman Catholic Church in America and Ireland. Frustrated with the lack of a hoped for revolution in Ireland, however, the American wing split into factions. A group led by William R. Roberts believed an invasion of British-ruled Canada would inspire an uprising in the old country and wrongly believed the U.S. government would not interfere. On June 1, 1866, the long expected invasion took place from Buffalo, New York, landing near Fort Erie in Canada West (now Ontario). 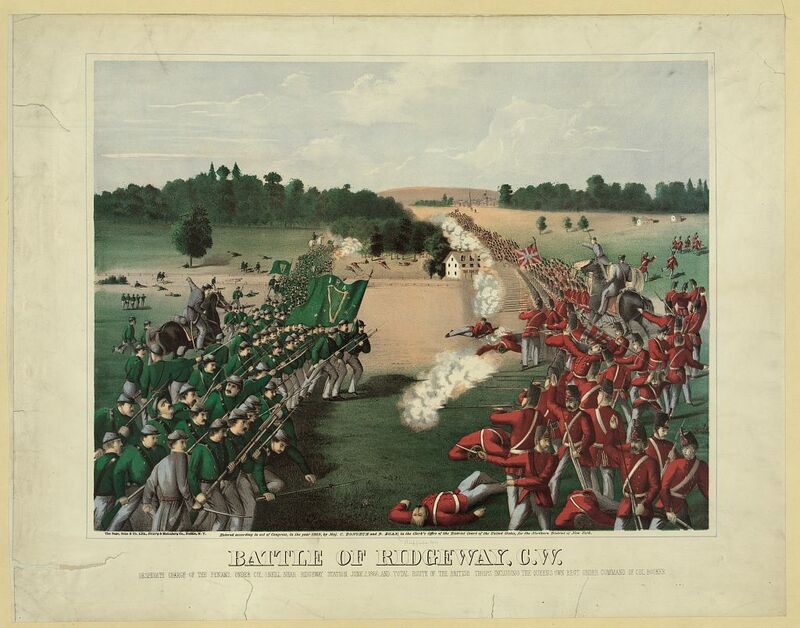 Although the Fenians won the Battle of Ridgeway on June 2, they were badly outnumbered by Canadian militia and British forces. They retreated the following morning back across the Niagara River to the United States where American authorities promptly arrested them. A smaller and even less successful invasion took place from Vermont into Quebec a few days later and was similarly repulsed with little effect on Irish independence. The Fenian invasions did, however, play a large role in the growing movement for the confederation of the Canadian provinces that took place the following year. 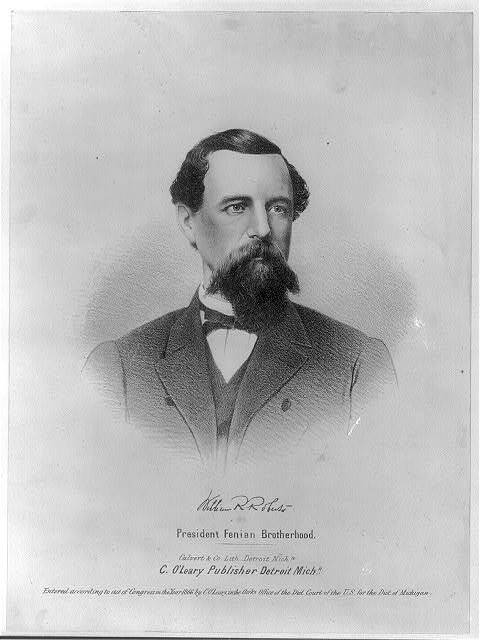 William R. Roberts, a Fenian leader who supported the brotherhood’s invasion of Canada (courtesy Library of Congress). Because of their secretive nature, historians have often relied on generalizations to describe the Fenians’ membership. The Fenians, we are often told, were virtually all Irish Catholic Civil War veterans. But records from the Toronto jail where prisoners from the raid into Canada West were held paint a more complex picture. Peter Vronsky, author of the best study of Ridgeway, recently shared with me two descriptive lists of Fenian prisoners imprisoned in Toronto on June 4 and 9. These documents provide very detailed information about each individual, including their birthplace, age, religion, nationality, residence, occupation, and previous military experience. Together the two lists total 79 individuals, not all of the Fenians captured in Canada West in June 1866, but probably the majority of them. In addition, almost all of the prisoners listed their last place of residence as the United States, generally in the North. They worked in a variety of skilled and unskilled occupations including but not limited to laborer, painter, sailor, farmer, tailor, and blacksmith. Not all of the prisoners on the two descriptive lists faced trial in Canada, but, by using the officially published record of the trials held in late 1866 and early 1867, I was able to learn the fate of twenty-nine of the men. Twelve were found not guilty, while seventeen were convicted and sentenced to death. Of those convicted, all but one listed their religion as Roman Catholic, including John McMahon, a 58-year-old Irish priest from Indiana. Making definitive claims about Fenian membership on such a small sample should be done with great care, and certainly a number of the prisoners might not have been Fenians at all but have simply been in the wrong place at the wrong time when incarcerated. Such may have been the case of Fresline Fry, a Swiss Protestant who had served in the British Army in the 1850s. Additionally, the descriptive lists seemed to have some spelling errors based on later trial transcripts, and some of the prisoners may have lied about some of the details of their lives, including their religion, age, or Civil War service. Still, in the absence of more concrete data on the secretive Fenians, the descriptive lists’ information suggests that the average Fenian soldier was about 25 years old, lived in the northern states, had an Irish surname, and denied “any connection” to the organization upon capture. My analysis of the list also suggests several important correctives to our common assumptions about the brotherhood. First, the Fenians had a significant number of Protestant supporters (about thirty percent of the prisoners) and were not all Catholic. Second, not all of the Fenians were Civil War veterans, with perhaps a majority (about sixty percent of the prisoners) not having fought on either side from 1861 to 1865 despite having lived in the United States prior to the invasion of Canada in 1866. I hope to eventually uncover more of the details of each Fenian prisoner’s experiences in the Civil War, such as their regiment, rank, and length of service, while also discovering more detailed information about the other Fenian prisoners held in Canada not on these two lists. Perhaps when combined with studies of other known Fenians, both in the senior leadership and in the rank and file, an even more definitive image of the typical Fenian member will emerge. For more on the Fenians and the ill-fated invasion of Canada in 1866, see W. S. Neidhart, Fenianism in North America (University Park: The Pennsylvania State University Press, 1975), Peter Vronsky, Ridgeway: The American Fenian Invasion and the 1866 Battle that Made Canada (Toronto: Penguin Group, 2011), and Lawrence E. Cline, Rebels on the Niagara: The Fenian Invasion of Canada, 1866 (New York: State University of New York Press, 2017). Other useful overviews of the Fenians and mid-19th century Irish nationalism include Oliver P. Rafferty, The Church, the State and the Fenian Threat 1861-1875 (New York: St. Martin’s Press, Inc., 1999) and Brian Jenkins, Irish Nationalism and the British State: From Repeal to Revolutionary Nationalism (London: McGill-Queen’s University Press, 2006). Police Department of the City of Toronto, “Description of Fenian Prisoners, June 4 & 9, 1866,” Department of Justice, Numbered Central Registry Files, RG-13-A2, Vol. 15, Library and Archives of Canada. An exact count of the Fenian prisoners held in Canadian custody is hard to come by, and many historians do not give a precise number. Cline claims that there were 117 held in Toronto jails, but this figure probably does not include those captured in Quebec. If the 117 were all captured after Ridgeway or at Fort Erie, the 79 in the two descriptive lists are a majority of the prisoners held from the Fenian invasion of Ontario (Cline, Rebels on the Niagara, 120). George R. Gregg, and E. P. Roden, Trials of the Fenian Prisoners at Toronto Who Were Captured at Fort Erie, C. W. (Toronto: Leader Steam-Press, 1867). An online version is available from Google Books here. For more about Fr. McMahon, see Joseph A. King, “The Fenian Invasion of Canada and John McMahon: Priest, Saint or Charlatan?” Eire-Ireland 23 (Winter 1988):32-51.